I found this on Gloria TV. I think the interview could be quite old. He speaks very beautifully on the matter of Holy Communion. When you're Pectoral Cross falls into a 'hiding place' accidentally...at the exact moment when you are in an 'interfaith' setting. This is an embarrassment that many Bishops can attest to. It clearly took His Holiness a long time to realise that his Pectoral Cross had accidentally been hidden. 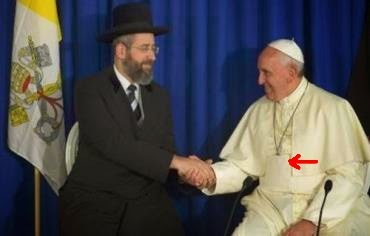 Why did nobody point it out to the Holy Father? Why does it always happen at just the wrong moment! Thankfully, we can rest assured that this was not a 'gesture', authentic or otherwise, and that these things just happen, because it seems obvious to me that any Bishop who hides Christ meeting anyone is some kind of, well, I am not sure quite what! The mysterious disapperance of the Cross was also a phenomenom that affected others in attendance. Ah well, there's always next time, Your Holiness. An unplanned gesture that could happen to anyone, or, even, everyone! Quick, put your Crosses away lads, its only polite! This image is beautiful. It sends out a clear signal - and I believe it is an authentic gesture - more authentic than your average authentic gesture - that the Pope can carry and does carry a black bag. I don't know about you but I respect anyone who carries a bag. Yet, I do wonder whether this black bag lark is a little 'outdated'. The Supreme Pontiff, in making a clear gesture that he is one of the ordinary folk who walk on a red carpet, need not use a black, leather bag. The red carpet, obviously, isn't anything fancy for Pope Francis himself, but symbolises the Blood of Christ that trailed through the street in that land made Holy by His Life, Death and Resurrection. For the Pope to give a sign of Our Lord's Passion and Death, as well as the blood of the martyrs is just beautiful. Beautiful. Is it just me, or is the Holy Father suggesting that there are times, even as Pope, in which His Holiness has engaged in what could be called 'inauthentic gestures' but that these 'unplanned' authentic gestures in the Holy Land were 'genuinely authentic'? Or is His Holiness saying that 'the most authentic gestures' are those that people in general do not think about? It is very kind of His Holiness to explain to us what differentiates an authentic gesture from a 'less authentic gesture'. A commenter called Alison Muir left a comment on my blog after my glowing report on Bishop Athansius Schneider. Where to begin with this appalling understanding of Catholicism? St Catherine of Siena was only a nun. St Therese of Lisieux was a Carmelite nun. St Francis of Assisi was only a layman and then friar. St Dominic was only a priest and preacher. St Anthony of Padua was only a priest and friar. St Athanasius was a Bishop. While heresy swept the Catholic Church like wildfire, among Bishops, he alone held out against Arianism and stood up for Christ. How many of the other Bishops of his day have their own feast days? I just booked a nine-seater vehicle today to go to Ramsgate to the Shrine of St Augustine tomorrow. Unfortunately, the car rental place is closed tomorrow because its a bank holiday. Anyone have any ideas other than the train? 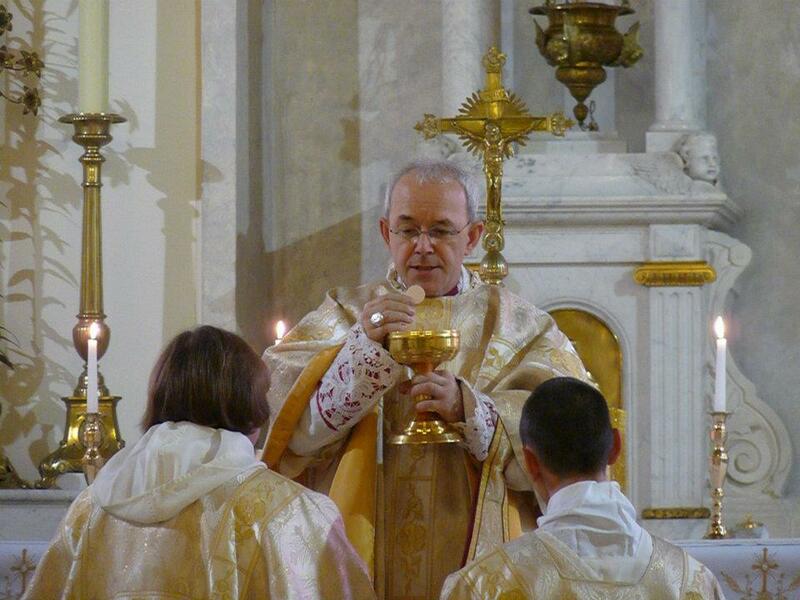 Bishop Schneider will not be celebrating Mass but will be preaching at the 6pm Mass at the London Oratory for St Philip’s Day. Unless a Miracle happens, I expect that, God willing, I'll see you there. Update: I can hire a car from Gatwick. Pray for us! Analogous to the precarious situation of Holy Mother Church? Warning: Graphic scenes of shark-related horror are in the video above. Heresy is like a great white shark in the water, seeking to devour the truth and with it the children of Mary and Jesus, encouraging people to embrace falsehood! and that the shark of heresy may be kept at bay, or speared and then blown up! One of the best lines in a movie ever. This is how to deal with heresy when it seeks to devour the barque! Go, Schneider, go! What efforts men will go to, to proclaim their humility! I have not been so impressed and excited by the words and example of a Bishop as I am about Bishop Athanasius Schneider for a long time. That said, there are not many Bishops who one can get excited about unless it is to be in a rather negative sense. In England and Wales, everything is rather negative, Bishops seem so embarrassed of our Faith. I was expecting to work today, so I could not go up to London, but it rained so I was not called in. That's the world of catering for you but that means I was unable to get up to the one day LMS Conference with Bishop Athanasius today. However, with the humble Bishop still gathering crowds, all is not lost, as he will be at the Shrine of St Augustine in Ramsgate on Monday. Guess who is considering hiring a car. There's a plenary indulgence waiting for the man who does, assuming I don't crash on the way. Bishops take note: Clothes maketh not the man! Imagine stepping into a Catholic Church and hearing this. Music breaks down walls. Music like this can break down thick walls of prejudice against the Church. At the Church I attended last week, this sublime music was sung during the Offertory. Why is it not sung in all Churches at its proper time in the liturgical year? Any era in the Church that rejects this music is positively insane. Only a Church that wanted to kill itself would do so. ...until he's done the 12-step programme. In order to lead the country you have to be sober at least some of the time. Still, they say it never did Churchill much harm. All joking aside, I expect that the IPA will be flowing for the next few days for UKIP. Good for them, they have made politics exciting again. The people have spoken (well, 34% of the people have spoken, some of whom voted UKIP) and the overwhelming opinion seems to be one of contempt for the political figures who show such contempt for those who have placed them in authority over them through the ballot box. 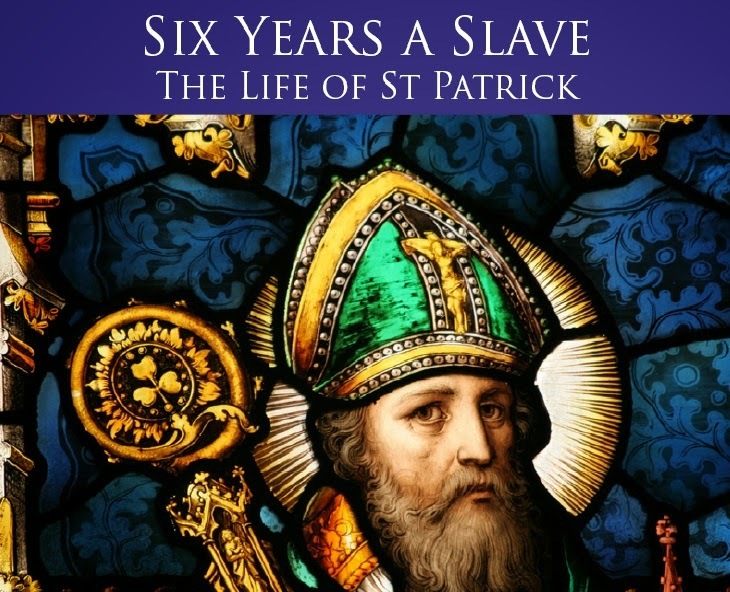 I have written an absurdly long blog post on the Bible and slavery following conversations with an atheist over Facebook. If you would like to read it, visit The Guild of Blessed Titus Brandsma. Say a prayer for this 20-year-old who committed suicide after a short period of unemployment. That a young man should commit suicide due to lack of work is truly terrible and saddening. Is a statement I can generally agree with. Since this is, in a simplistic way, what the Church teaches. Nor is equality in human dignity even the focus of so many 'equality campaigners'. Our Lord Jesus Christ did not teach equality and if you can find me a passage of Scripture in which the doctrine of 'equality' is expounded, I will be very surprised indeed. Be a religion known for intransigence and even violent defence of its own interests rather than a religion known for its tolerance and subservience to the State? It will be interesting to see how Ofsted react to being shown the door at a Luton Muslim school. Why has no Bishop tried that, I wonder? The Guild of Blessed Titus Brandsma Needs You! This is a reminder to members of The Guild of Blessed Titus Brandsma, that the Guild's blog benefits greatly from bloggers contributions. If you would like to contribute to the Guild's blog, if you are a member, a registered author, please feel free to write something and post it up. If you are not a member but would like to contribute something to be considered for publication, send something over to me at englandsgardens@googlemail.com. God bless readers and may Blessed Titus Brandsma intercede for the good success of the Guild's work in apologetics and evangelisation. As well as these works for Christ, The Guild exists to offer support to Catholic bloggers who work often in isolation. Equality is worse than a Myth. It is a Superstition. ‘Equality’ is not a true law, nor can it justly be called a right. It’s dominance of popular culture has rendered it worse than a myth. If people are caught up in the notion of equality today it is because man easily becomes caught up in superstition. What has given the word ‘equality’ – a word that has never lost its emotive power since the dawn of the Enlightenment - the power and force that it has in today’s society? We now hear this word, particularly in the realm of gender and sexuality so much and it so dominates the public forum that for anybody to contradict the very notion of equality is to have committed a formal and public act of heresy that warrants public exclusion, potential loss of employment and perhaps worse. Oh joy! Diego Maradona, the unrepentant cheat from Argentina, unlike that nice Gary Lineker, is rather taken by Pope Francis. Perhaps, we should not be too surprised. I do not wish to revel in the vices of others, but the unrepentant cheat, whose comeback in another world cup was ruined because of his habitual cocaine use, claims to have found something of a Supreme Pontiff after his own heart in the Pope from the New World. 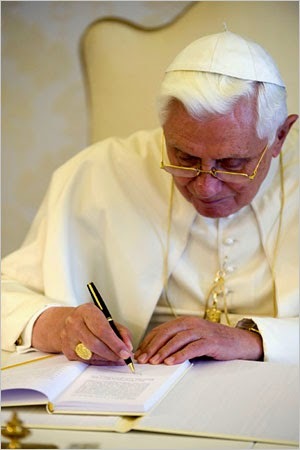 “The Vatican, for me, is a lie because instead of giving to people it takes away. All popes have done this and I don’t want him to do it,” Maradona said during an interview with a Naples TV station, according to Reuters. I am so excited about Bishop Athansius Schneider's coming the the UK. As part of the tour, the Bishop will be coming to West Grinsted on Saturday for a Pontifical High Mass. Full details of the Mass in the Extraordinary Form are here, along with full details of his whistlestop tour of the UK. May this good Bishop continue to give witness to the Lord, most especially to the reverence with which we should honour the Blessed Sacrament. Deo gratias! Fatima supporters are widely regarded as being a bit 'out there' in the Catholic Church. I think that, in a way, the Fatima children gave Catholics who promote the message of Fatima a good preparation for rejection since they, also, were widely rejected until evidence of the supernatural became more extended, for instance, during the Miracle of the Sun. Still, even after that, a lot of Bishops would say that Fatima is not important. I really doubt that Fatima is not important. The message of Fatima, essentially, is 'repent for the Kingdom of God is near at hand'. If that's not important, then what is? However, it is kind of to be expected that the Feast of Our Lady of Fatima should become regarded by some - or even many - in the Church - as something of a feast for the fruitloops, because within the Fatima camp are some ideas that are truly 'out there'. I don't know whether Pope Francis celebrated the Feast today - after all, it was an option. And don't be like this guy (pictured left). His Holiness Pope Francis has a little more elaboration on the spirit and the law today here. While Ed Peters of 'In the Light of the Law', has his own thoughts on the musings of Cardinal Walter Kasper here and here. A little bit of respect for the law is not a terrible thing, especially Church law, lest Church ministers become like unto the lawless one referred to by St Paul in his epistle to the Thessalonians. Well, thanks be to God and Our Blessed Lady the alternative black tie event at Harvard was cancelled! How can we extol thee enough O Woman who crushes the serpent underneath thy heel! Mark my words though, the damage is done and there is now no chance I am sending my children to Harvard. I must say I find it quite disturbing that commenters at the foot of a Time Magazine article are calling the cancellation a defeat for religious liberty. "...Jesus wishes to use you to make me better known and loved. 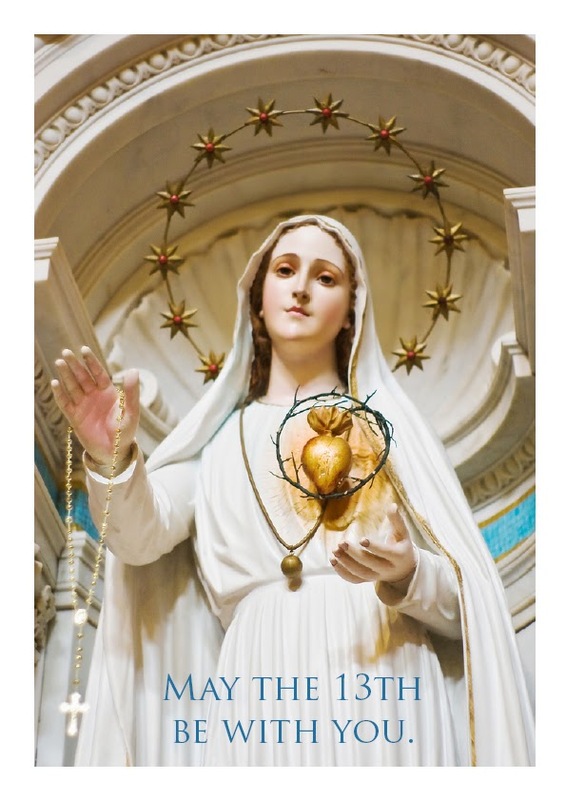 He wishes to establish in the world devotion to my Immaculate Heart." Lucia was suddenly sad. "Must I stay here all alone?" "No, my child", the Lady replied gently. "And would that make you suffer? Do not be disheartened. My Immaculate Heart will never abandon you, but will be your refuge and the way that will lead you to God." As she said these words, the Lady again opened her hands on the three children and communicated to them the same immense light that had overwhelmed them a month earlier. Francisco and Jacinta seemed to be in that part of the light which rose towards Heaven and Lucia in the rays which spread over the world. In the palm of the Lady's right hand, the children could see a Heart, ringed with thorns which seemed to pierce it. They understood this to be the Immaculate Heart of Mary, grieved by the sins of humanity and seeking reparation. Rumour has it that a new Star Wars is coming out featuring the 'original cast'. No Alec Guinness, though, so I won't be attending any screening. 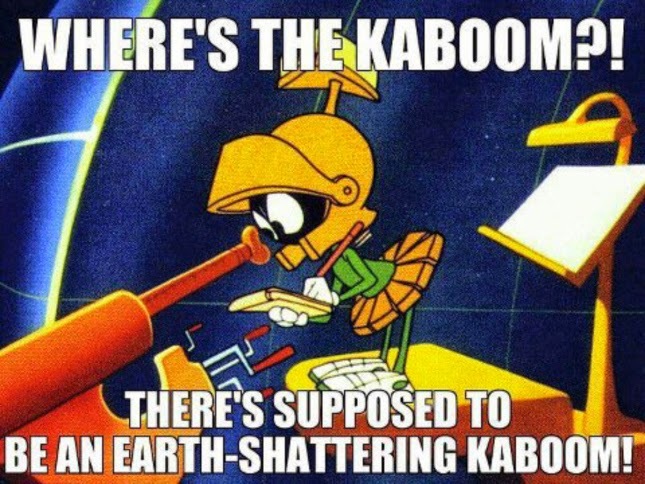 Let's hope this is not an accurate depiction of the forthcoming Synod, though I wouldn't object terribly if Cardinal Walter Kasper was thrown into the Abyss of deep space right now. That's a joke obviously. May the Lord preserve that Prince of the Church! I love the way Luke says, "I will not fight you, Father", after having just kicked him down the stairs. 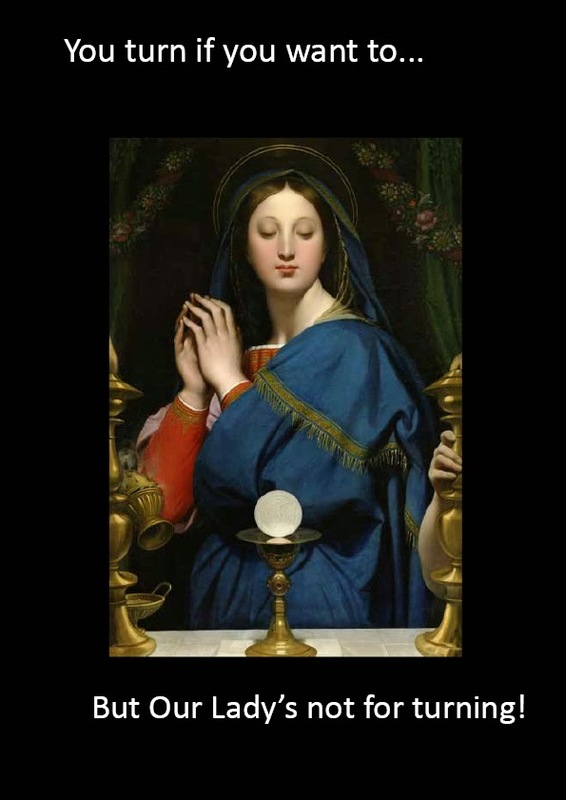 Mother of God, Mother of the Church, Mother of the Eucharist, Queen of Heaven. Defend the Body and Blood of Your Son from every possible violation! '"Who are we to close the doors" to the Holy Spirit? This was the question that Pope Francis repeated this morning during his homily at Mass at Casa Santa Marta, a homily dedicated to the conversion of the first pagans to Christianity. St Peter and the Apostles did not believe converting people was solemn nonsense, then. The Holy Spirit, he reiterated, is what makes the Church to go "beyond the limits, go ever forward". The limits of what, forward where? A quite thought provoking article at Harvesting the Fruiton the Black Mass at Harvard and religious freedom. It is an open secret that a candidate for 33rd degree Freemasonry has the true 'god' of masonry revealed to him (yes, its always a him) and the name of that 'god' is Lucifer. I don't hear many Bishops or Priests objecting to Freemasonry. What the Devil is He Playing At? And so it was that the Devil, who so loathed the work for Jesus Christ of a blogging Deacon, and who was so enraged that this work was gaining in popularity and influence, because it dared even to name those who were dragging the name of Christ through the mud, inspired some to ensure that his blog was closed down. The Bishop who was deeply involved in the closure of the Deacon's blog may take another view of that, but I am entitled to my opinion. A spiritual explanation may be one explanation among many, but its a perfectly valid one in the Catholic Church. That Deacon, however, has a new book out called'Who is the Devil? What Pope Francis Says'. Few Popes have said as much about the Devil as this one, or, at least, not in such a short space of time. The combat taking place between God and the Devil has been the subject of many a Papal homily. It was nice to be reminded by Pope Francis that, though we are all called to be Saints that the Saints are sinners sanctified by God, made holy by God. It reminds us that without sanctifying grace everything is impossible for us, but that, with the grace of God, everything is possible. I cannot help but feel inspired by these great heroes of God, these heroes of the Church and I will always pray to these great heroes and heroines of the Church for special graces. The intercession of the Saints is powerful before God's Throne. Recently elevated to the Cardinalate, Lorenzo Baldisseri, head of the Synod of Bishops, has put his mitred head above the parapet to proclaim his doctrinal position against Christ. Is this Train Going to Littlehampton or Brighton?